Find below the best LinkedIn Marketing Courses from top education providers, schools, training colleges and institutions. Written by MAU. Digital Marketing Specialist at eDigital. By Feb 2019, LinkedIn has reached 590 million Linkedin members, making it one of the most popular social networks for professionals and one of the top social networks overall. But are you using LinkedIn to its fullest potential? LinkedIn is extremely powerful if you need to reach out, promote and network with professionals in a specific industry — especially when you are trained in all the platform’s hidden features that don’t get nearly as much attention as they deserve. Find the Best LinkedIn Marketing Courses in 2018. 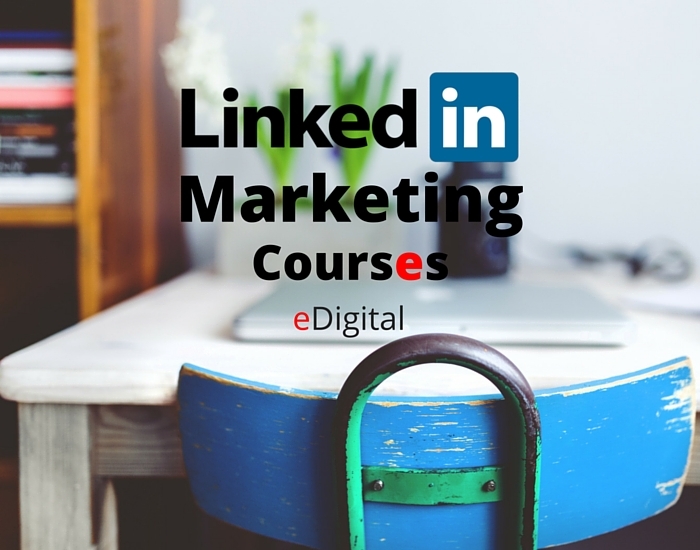 This 2018 list of Top Best LinkedIn Marketing Courses has been curated by eDigital and sourced from the world’s top best academies, universities, colleges and schools. Linkedin no longer accept Influencer applications. Top executives waiting to apply or receive an invitation to the Linkedin Influencer program are invited to start creating long-form posts. eDigital can offer strategic and tactical support to your CEO’s or top executives on Linkedin Long Form Posts. This will include reviewing and defining Linkedin Content strategy, amount of posts, posting frequency, content personality and voice, amplification methods and more. Send Mauricio an email to find out more. LinkedIn Influencer is a designation given to approximately 500 professionals who’ve been invited to publish on LinkedIn. As leaders in their industries, geo-areas, they discuss topics of interest, such as leadership, management, HR, disruption, and more. Some top influencers include Richard Branson, Bill Gates. Linkedin work with Influencers to develop relevant content topics that will spark inspiring professional conversations. The list of Influencers changes throughout the year to include only the most engaged, prolific, and thoughtful contributors and to ensure that their expertise matches Linkedin members’ interests. NOTE: By March 2016, Company profiles cannot publish long form posts. Only personal accounts (both free and premium) on some countries (not all countries) have access to the long form posts publishing option. Everything you need to know about Long form posts is here. If you’re new to promoting your business on LinkedIn, this free online course will teach you the basics of navigating the platform, creating original content, targeting an audience, publishing ads, and tracking campaign performance. Marketers should watch this series of short, informative videos to get a step-by-step tour of these LinkedIn strategies and tools. At the end of the course, you will have enough information to create your first campaign and measure the results. Your LinkedIn Company Page has the potential to be a highly valuable piece of real estate. When your Company Page optimized to serve your marketing goals, you’re far more likely to engage your target audience. This downloadable playbook will help brands create a Company Page that builds thought leadership, attracts sales prospects and potential new hires, and serves as a hub for targeted content. Use this guide to turn your Company Page into the high-value destination it can be. Every brand wants to know how to get its content in front of the 500+ million professionals on LinkedIn. This tactical plan is designed to help you incorporate LinkedIn into your integrated marketing strategy. You’ll learn how to drive tangible ROI from all of LinkedIn’s marketing solutions. This guide will teach marketers which types of content perform best with each campaign channel, as well as the anticipated time investment required for each channel. You can also download a 1-page printable plan to help build a killer content strategy for LinkedIn. All of the tips, tricks, and insights we apply to our own marketing strategy through LinkedIn. Download this guide to learn how we define our marketing goals within the platform, how we develop our bidding strategy and budget management, how we balance unpaid and organic campaigns, and other useful lessons we’ve collected through our first-hand experience. This guide focuses on the entire lead pipeline, as well as revenue. Sophisticated marketers can use this guide to move “beyond the click” and use attribution and measurement to evaluate leads on the basis of their quality, rather than their quantity. Discover the cutting-edge best practices for incorporating LinkedIn’s campaign channels into your digital marketing strategy.